There are two Phi Phi islands: Phi Phi Don and the smaller Phi Phi Le. There are no tourist facilities on Phi Phi Le, which has just a few locals in residence. However, it is a popular - some say too popular - day trip destination to swim in "Maya Bay" and view the 'viking' graffiti. Phi Phi Don is where all the accommodations and other services are located. The island consists of two stone ridges, joined by a narrow sandy spit. The western spine is almost sheer cliffs all the way around. The only people who explore it are rock climbers. The eastern ridge is less challenging, although there are stone outcrops in parts. 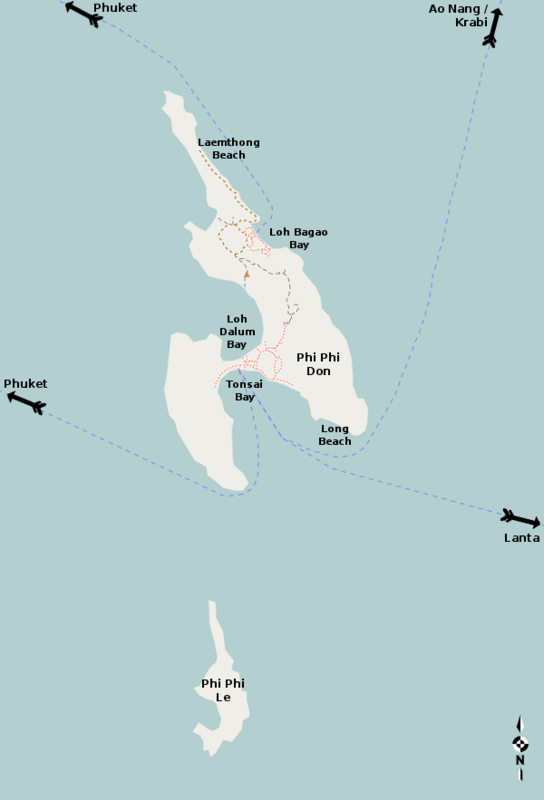 All of the beach resorts are on this eastern spine, or on the spit of land that connects the two stone ridges. That sand bar spit is where the biggest concentration of development is, with a lot of small hotels, restaurants, shops and services. The isthmus forms two bays: to the north, Loh Dalum is very shallow, with a wide sandy beach the becomes enormous at low tide. On the contrary, Tonsai bay to the south is much deeper, with a steep, slightly rocky beach. So, Tonsai is where all the ferries from Phuket, Krabi, Lanta, etc. dock, as well as the day trip boats to Phi-Phi Le and beyond. The 'village' between Tonsai and Loh Dalum tends to be full of 20-something backpacker types, and all the cheap food and other services they desire. The other, more remote areas such as Laemthong beach, tend to have a bit more of that 'get-away-from-it-all' feel that older travelers may be looking for.